There has been an uproar in Afghanistan because Korans containing extremist messages were removed from a detention center library and tossed in a trash pile to be burned. Detainees were reportedly using the books to exchange extremist messages, and they knew the U.S. would be afraid to destroy them for fear of causing just the type of rioting we’re seeing now. So far four Americans have been killed, including two who were working at the Afghan Interior Ministry that we bankroll. Republicans have criticized Obama for apologizing for the burning of the Islamic holy books, but the truth is this is a classic damned if you do, damned if you don’t, scenario. It’s an issue that’s custom-made to inflame passions, and no matter what we do, it will be wrong. The real problem is there is a fundamental flaw in the way the West wages war. We spend too much time trying to win the hearts and minds of the defeated people. The vast majority of any conquered population will resent the presence of their conqueror, and no amount of pandering is going to change that. 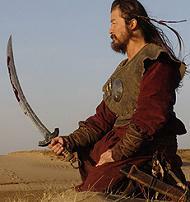 The only proper way to wage a war is to do it like the Mongols. If an enemy quickly submitted, their lives would be spared, but they may be enslaved. If they resisted, they were annihilated. Genghis Khan was not averse to killing every male taller than the axle of a cart, and when Tamerlane besieged Delhi, he built a pyramid of 90,000 heads outside the walls to give them a graphic example of what they could expect from continued resistance. I disagree with our presence in Afghanistan, but I have a hunch that we’d be better off building skull pyramids than infrastructure.